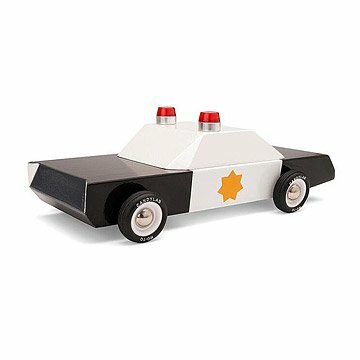 This wooden police car is inspired by classic toys and cars. Shiny and substantial, this solid beech wood black-and-white cruiser draws its bold, boxy lines from the nostalgia of built-to-last toys and the all-American appeal of classic cars. Brooklyn-based designer Vlad Dragusin nurtures the conviction that well-made, straightforward toys can spark the imagination and appeal to playful children and adult collectors alike. His throwback designs call to big kids with an appreciation for mid-century minimalism, as well as to little kids who are just discovering the allure of the muscle car. Made in China. Vlad Dragusin is a Brooklyn based architect and designer with a serious love for midcentury minimalism and American car design. His upbringing and career path emphasized a deep practical approach to real-world problems, always carefully wrapped in polished visuals and with a delicate balance of proportions. The resulting mix, seen through a father's eye and a playful mind, was a focus on product design as a way of addressing design needs for everyday use, and subtly shaping perceptions where a need was felt. As such, toy design came naturally as a strong interest, and more specifically wooden toy cars that are unmistakably modern, but possess a throwback vibe. Clean with damp cloth, keep away from direct water contact.